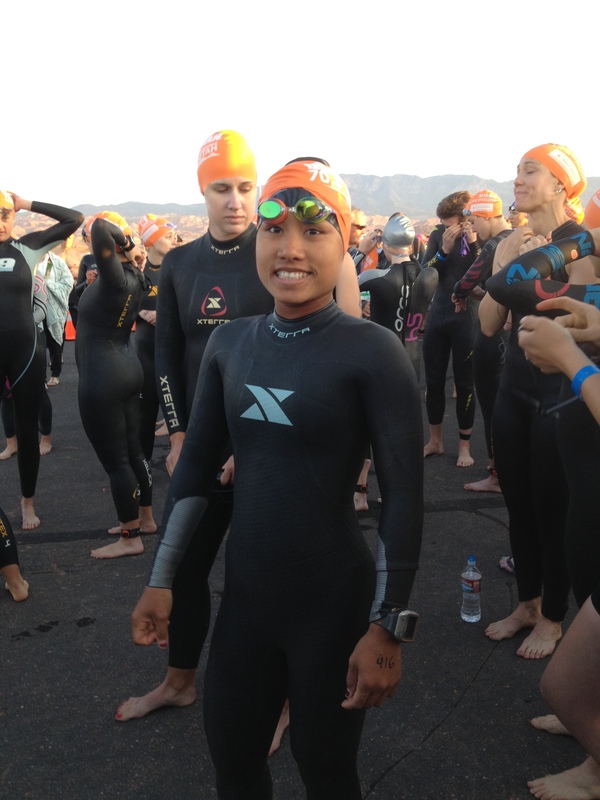 St. George Ironman 70.3 was kind of a after thought this year. I was originally registered for Wildflower long course but with the drought and course change my husband and I decided a change in scenery might be fun. I was really looking forward to the challenging course as many reviews of the race compared it in many ways to Wildflower long course. I had been training hard and feeling really good until two week before the race I came down with a chest cold…. :( One day off from training turned into two and then four and then 7. I was feeling about 90% 7 days out and went on a 50 training ride with a group of FAT members. I pushed it a little too hard and found myself right back to bed rest, vitamin C and anything else I could get my hands on. I had never gone into a race with no training for two weeks and was worried about how things would go…. Race day morning I felt good but not great. After a quick 5 am stop at T2 to make sure my run gear was still setup it was off to the 30 minute drive to the swim at Sand Hollow resort. The water was 61 degrees and I was in the 4th overall wave after the men and women pros and men 25-29 relay. The gun fired and my wave of 29 and under women were off! I realized very quickly that this was going to be a very long day when only 5 minutes into the race I began coughing and wheezing. I tried to stay with the lead pack but it wasn’t happening today. About halfway into the swim it felt like I was coughing blood and now just wanted to FINISH the swim. I was 15th out of the water in just over 34:00 and almost decided to call it a day. I couldn’t breathe and I knew I was way off the time where I should be. I decided to continue and maybe I would fell better on the bike. T1 was smooth and was happy to be on the road until about 4 miles in. I threw my chain and it was a good one. After spending about 3 minutes trying to pull it out of my frame a guy stopped to help me. I felt bad that he was losing his time but was so thankful to have the help as I don’t think I could have got my chain back on without him. We spent another 2 or 3 minutes working together as I watch woman after woman go by. We finally got it fixed and I was back on my bike trying to run down the women that had gone by. I had a decent bike considering and passed many over the next 52 miles. The course was not as challenging as Wildflower for me. It has a lot of hills but none very long or very steep. The course is beautiful! The scenery is things I have not yet seen since I came to the US in 2006. There was zero wind and without further challenges. T2 was also smooth and as I passed my husband onto the run he told me I 6th. I had lost count of how many I passed on the bike and was both happy and frustrated with 6th. My lungs were still burning and I was coughing and couldn’t breathe but just wanted to try and hold my position and maybe hope for a miracle to get on the podium in the top 5. That wasn’t to be. The run at St. George is every bit as difficult as Wildflower if not more difficult. It is hard to measure because of how I was feeling but the hills were long and steep and there were many!. I pushed myself as hard as I could and held onto 6th for all the way up to .5 miles to go when I was passed! I see the finish line and push to the end. Finishing 7th in my age group was for sure short of my goal and it was not enough to qualify for 70.3 World Championships. I did finish though and that is something that I am proud of. I paid for it the following week and am just now back onto my normal training schedule. I am considering heading up to Boise Ironman 70.3 on June 7th. Will make that decision this week.